Elsewhere in this issue I have started a series on making joints - discussing tools in the first part - so it seemed appropriate to look at some lovely carpenter's chisels to whet your appetite. Pfeil is a well-known and respected Swiss brand, with all that implies in terms of a reputation for quality. It is interesting to note the difference in interpretation of the word 'carpenter' between different countries and respective work cultures. In the UK and the USA chisels for carpentry can be expected to have tough plastic handles, possibly with a striking cap to resist heavy hammer damage. On the continent it seems craftsmen are a little more caring about their tools, so Pfeil have fitted elm (Ulmus procera) handles without hoops at the top or leather washers at the handle bottom to reduce shock. Indeed, with this set I wouldn't be comfortable using a mallet except for very light taps. The blades are reasonably thick in cross-section, with straight sides that are relieved with a limited bevel, telling us they are unsuited to working on dovetails as they cannot fit into acute angle recesses. The blades are polished, but happily without removing the essential milling profile. The tapered necks have a brass ring above, with a tang fitted in the handle. 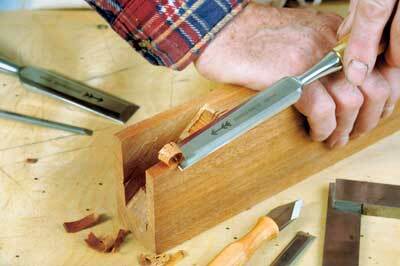 In addition, this set comes with a double bevel, thick blade marking knife suitable for left or right-hand use. 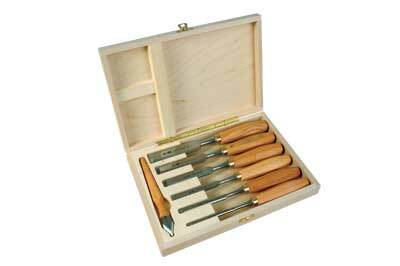 The chisels in this set range from 6-26mm, although the entire range runs from 4-40mm. I'm not a cognoscenti of blade steel, but I'm always looking for a sharp edge that stays sharp with plenty of use, so my hopes were high as these blades are touted as K510 steel hardened to RC60. Considering the blades are polished and the presentation in the case is good, the elm handles are a bit 'raw' by comparison. I would definitely give them a light rub down and oiling until they're silky and feel more pleasant to hold. The blade backs need a little flatting, which is standard with new chisels, but removes a bit of the shine. The edges only needed a light 'micro bevel' to bring to a state of readiness. The blades cut really cleanly and are a pleasure to use apart from the handle 'feel'. Overall a nice set that will tackle a wide range of tasks that could be bolstered with the addition of a couple of wider blades for paring work.